“A Thousand Sarajevos” is the debut CD release from Massachusetts-based "East of Shirley." A collection of 11 original compositions, the album’s songs were written by singer/songwriter and EoS frontman Michael Clark. They were recorded by the group at Silvertone Studios in Groton, Massachusetts, in 2007-8. “A Thousand Sarajevos” is a body of work that reflects a personal journey and an evolving political consciousness. Songs of memory, desire, imagination, longing, and loss are contrasted with expressions of disillusionment, anger, and ultimately, hope. While steeped in the singer-songwriter tradition that has emerged and developed since the ‘60s, the album is contemporary and forward-looking in both its focus and its sound. Because Sarajevo, or things very much like Sarajevo, just keep happening. And on it goes. From the holocaust of the slave trade to the litany of more recent holocausts, some still within the memory of many, from King Cotton to the Final Solution, and from genocides denied to genocides forgotten, “civilization” has marched along. Years after the Holocaust of the Nazis, with the phrase “never again” still echoing in our ears, we were greeted, some of us as children, with the cries of the Biafrans and Cambodians. And then, as adults, we were confronted not only with Sarajevo, but with Rwanda, and Kosovo. And now Darfur. Darfur. Who could have ever imagined it? And, so, in Sarajevo, between 1992 and 1995, the Bosnian Serb army, determined to keep the new Bosnian state from realizing its independence, fired thousands of mortar shells a day into that besieged place, killing scores of innocent civilians and devastating this beautiful, ancient city - once a symbol of diversity and tolerance. Today, the places where mortar blasts found their victims and left permanent fragmentation scars on buildings and pavement have been filled in with red epoxy - creating striking rose-like memorials to those who died during this latest convulsion of European fascism and genocide. 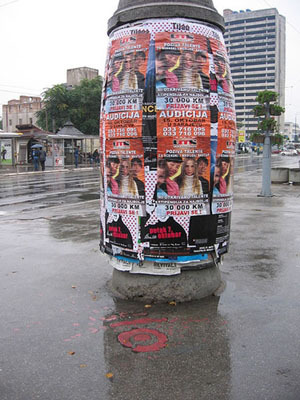 Below is a photograph of one such “Sarajevo Rose,” taken in Sarajevo’s “Snipers’ Alley” in October 2005 by Jen Marie Johnson (used by permission). Sarajevo stands today as a metaphor for the sort of history that we need to put behind us, finally and forever. 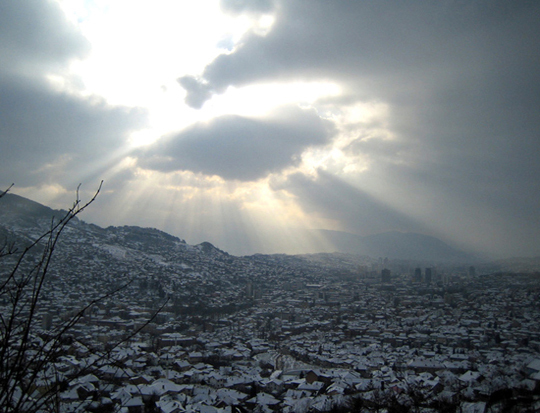 That’s “why Sarajevo.” It serves as an inspiration for those who continue to fight injustice, and as a reminder that the sun does indeed return to the mountains after the snow.